by President Thomas M. Mengler, J.D. While attending our annual banquet for student-athletes recently, I experienced first-hand why maintaining St. Mary’s University’s Catholic identity and Marianist charism is so important. In the past four years, I’ve met some amazing people, had some unforgettable times and learned valuable lessons that go far beyond the classroom. I’ve learned to be a leader, how to be a follower, how to be a volunteer and how to be a friend. And yeah, I took a bunch of Chemistry classes and learned how to code, but, at the end of the day, what does any of that really mean if I don’t know how to be a good person? It took me a while, but now, in this moment, I can truly say that I have found myself and that my faith in God is stronger than ever. From all the prayers at Mass, the ones before soccer games and especially the ones before tests, I’ve done a lot of talking with God. Throughout all of our conversations, He has reassured me time and time again that I’m on a good path, and everything will work out. Not all college students are as focused and grounded as Kiernan, who earned a bachelor’s degree in Engineering Science in May. In greater numbers than ever before, this country’s young adults are increasingly joining the “nones” club — men and women who profess to have no religion whatsoever. I view this trend as troubling and, quite frankly, a growing challenge for our country. I am happy to report, by contrast, that at St. Mary’s more than 55 percent of our freshmen in recent years list the University’s religious nature or affiliation as important or very important in their decisions to enroll. Some might view that figure as too low. But in a culture with so many unhealthy distractions, I regard it as remarkable that at the front end of their university time, more than half of our undergraduate students — mostly 18-year-olds — choose St. Mary’s because of its Catholic and Marianist identity. As Kiernan’s remarks make clear, even more of our students leave St. Mary’s as faith-filled servant leaders than when they arrive. Mary Moipei (from left); the Rev. Martin Solma, S.M., St. Mary’s Chancellor; Marta Moipei and Magdalene Moipei reunited before Spring 2018 Commencement, at which the Moipei triplets received bachelor’s in Music and Solma received an honorary doctorate. Other such examples are the Moipei triplets — Magdalene (Maggy), Marta and Mary — who graduated with bachelor’s degrees in Music in May after being drawn from Kenya to St. Mary’s by the Rev. Martin Solma, S.M., St. Mary’s Chancellor. Thanking Solma for the opportunity to further their education, the sisters said they believe that by sharing their voices with others, they are also sharing their faith and love of God. In addition to drawing such talented students to St. Mary’s, Solma has provided extraordinary support for the University during his eight-year term as Chancellor and Provincial of the Marianists. He supported the development of a new Center for Catholic Studies, helped permanently bring to campus the National Archives of the Marianist Province of the United States, and made possible a partnership with the Archdiocese of San Antonio and the Marianists to revitalize our next-door neighbor, Holy Rosary Catholic Parish. The embracing nature of our community in the family spirit, our collective commitment to the dignity of each human and the common good, and the many ways in which we foster the development of our students into authentic, faith-filled adults — these features find their theoretical foundations in Holy Scriptures, Catholic social teaching and the Society of Mary’s special charism. These features — what makes St. Mary’s the great University it is — are what alumni, young and old, want to talk about when I meet with them. These features are readily apparent to parents and prospective students when they visit our campus. And these features, as noted above, are significant reasons why applicants choose to enroll at St. Mary’s. As most of you know, during my six years as President, I have sought to promote and expand St. Mary’s religious dimension. Indeed, the second goal of our Gateway Strategic Plan charges our community of faculty and staff to “foster formation of faith at St. Mary’s and throughout the Southwest.” This goal calls us to be intentional and deliberate in promoting our Catholic and Marianist identity — and with a sense of urgency. There is urgency because there are only a few hundred Marianist brothers in the United States, many of whom are retired, and vocations to the Society of Mary are meager. With dwindling numbers, U.S. Marianists today are drawn in many directions. The Society of Mary in the U.S. sponsors three universities, 19 middle and high schools, and four retreat centers. Hence, the responsibility to nurture our Catholic Marianist identity rests squarely on the shoulders of lay faculty and staff and the Board of Trustees. Whereas 50 years ago, there was little or no talk about St. Mary’s mission (there was no such thing as a mission statement then) — because the place was crawling with Marianists — “mission talk” today pervades the daily discussions of faculty, staff and students. In several ways, our faculty and staff are integrating our Catholic and Marianist mission inside and outside the classroom. Each of our four schools has its own chaplain, who engages our students in daily discussion. More than 25 lay faculty and staff are Marianist Educational Associates, men and women who meet together regularly and who are invested in growing in their understanding of the Marianist charism and in embodying it in their work lives on campus. The St. Mary’s Office of Civic Engagement promotes the spirit of serving others, especially those who are most in need of our care, including through a signature project, 40 Days of Service and Lent. Our career services office, called the STRIVE Career Center, encourages students to view their future careers as vocations, as a calling by God to use their gifts and talents to make a difference. The “V” in STRIVE stands for vocation. And, of course, the Office of University Ministry fosters the prayer, reflection and worship life of our community. A second program is our Peer Ministry Program in which undergraduate students who live in the residence halls are charged with building community and fostering the faith lives of their fellow residents. That said, St. Mary’s University, as Catholic and Marianist, posits that humans, made in the image of a loving, rational God, have the intellectual capacity to discern truth, beauty and good — and thereby come closer to God — by using their reasoning faculties, along with the grace and blessings of faith. Catholic Intellectual Tradition, Catholic social teaching and Marianist spirituality offer powerful lenses through which we can understand all aspects of the world, God’s presence and our roles. Hence, St. Mary’s core curriculum educates our students to look at God, self, our neighbors and nature through the perspective of Christ’s message, among the many perspectives our faculty bring to the classroom, to develop students’ critical thinking capacities. Invitation, not indoctrination, is the Marianist strategy, because, ultimately, each person must choose his or her own path. A major priority of St. Mary’s $130 million Defining Moment Comprehensive Campaign is to raise the resources necessary to establish a Center for Catholic Studies. While our fundraising is still ongoing, we have already raised millions of dollars. These gifts are helping establish a Chair in Catholic Philosophy held by Professor Glenn Hughes, Ph.D., (whose principal role is to host seminars and retreats for lay faculty), a Chair in Catholic Leadership (funded by the Alumni Association) and a Marianist Chair in Catholic Educational Leadership through a $1.5 million gift from the Marianists created with Solma’s assistance. 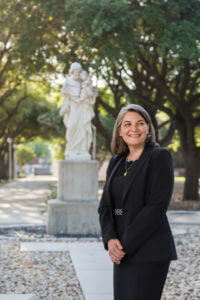 Alicia Cordoba Tait, D.M.A., joined St. Mary’s as the inaugural Beirne Director of the Center for Catholic Studies in June. Through these gifts and from benefactors Martin Beirne (J.D. ’69) and Kathleen Beirne, Ruben Escobedo (B.B.A. ’60) and Veronica Salazar Escobedo, and Glenn MacTaggart (J.D. ’79, M.A. ’89) and Karla MacTaggart, we are now in position to launch the Center beginning this academic year. Alicia Cordoba Tait, D.M.A., joined St. Mary’s University this summer and began leading the Center as the Beirne Director. Interdisciplinary in scope, the Center will engage students and faculty in every field of study — business and law, science and engineering, and humanities, social sciences and the arts. The Center for Catholic Studies will enable faculty and students to explore, from Catholic and Marianist viewpoints, the most pressing regional, national and international social policy issues. These questions involve poverty, economic justice, religious freedom, aging and disability, the dignity of human life, immigration, sustainability, technology and its roles, the protection of nature, as well as the central question of the role of faith in society and culture, and in individual formation. The Center should also specifically examine the Catholic Church in society and culture, including issues particular to the Catholic Church’s presence in the Southwest and the growing nationwide Hispanic presence in the Church and other Christian denominations. Those alumni who are not Catholic might wonder whether achieving our goal of fostering our Catholic and Marianist identity — including by establishing a Center for Catholic Studies — will exclude, isolate or make uncomfortable those members of the St. Mary’s community who are neither Catholic nor Christian. I urge you not to worry. At the heart of the University’s past, present and its bright future is a Marianist spirituality that emphasizes a teacher who is truly present to students, not only by teaching, but also by loving and respecting them. St. Mary’s University — animated by Christ’s message of charity, compassion and respect, and the Marianists’ humility and commitment to community — invites and welcomes men and women of all faiths, and even of no faith, to walk and talk and search for truth together.